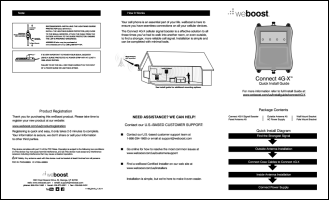 weBoost’s most powerful 4G consumer-grade cell phone signal booster for homes. Works with all major U.S. cellular carriers and networks. Boosts cell signal in your home for multiple users. Includes two inside broadcast antennas: a wall-mount panel antenna and a bonus ceiling-mount dome antenna. The weBoost Connect 4G‑X cell phone signal booster provides maximum power for the best possible cellular reception in your home. Stay connected with the strongest cell signal, and experience fewer dropped calls, undelivered texts, and missed email messages. Keep your data moving faster in areas with weak cell service and in buildings that block outside cell signal. Who is the weBoost Connect 4G‑X for? Those who frequently experience dropped calls, undelivered texts, or slow 4G internet at home. Homes with building materials that block outside cell signal (plaster, concrete, UV-coated windows, etc.). Homes with basements, theater rooms, metal out-buildings, and other places where cell reception is poor. Alternatively, you can have a professional install your booster system at additional cost. Please contact us and we’ll put you in touch with an installer in your area. 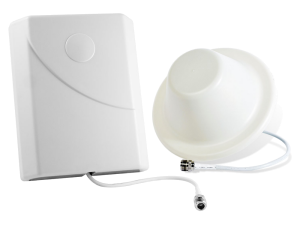 This kit includes two inside antennas: a panel antenna that mounts on a wall, and a dome antenna that mounts on a ceiling. You may use either antenna, but not both together. The panel antenna is directional, focusing its broadcast signal outward in a cone shape, similar to the light from a flashlight. 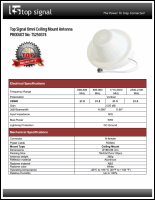 It is easier to install than a dome antenna, but provides a more limited area of coverage. The dome antenna is omnidirectional, broadcasting downward in 360° spread. Setup requires a ladder and access above the ceiling, so it is more complex to install; however, it provides a greater area of amplified signal. You may use whichever antenna best suits your needs. 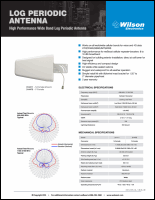 Using Wilson Electronics’ patented SmarTech III® technology, the weBoost Connect 4G‑X system receives the outside cell signal, amplifies it, and rebroadcasts it inside your office through four inside antennas. This allows you to stay connected in areas where cell service is poor, or where your office’s building materials interfere with signals from the local cell tower. 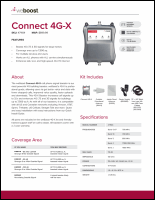 The weBoost Connect 4G‑X works with all major wireless carriers, including Verizon, AT&T, T‑Mobile, Sprint, U.S. Cellular, and most others. How much area will the weBoost Connect 4G‑X cover? Outside cell signal strength received by the donor antenna. 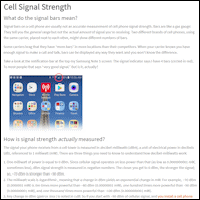 In general, the stronger the outside cell signal, the greater the interior broadcast distance. Powerful Signal has over a decade of experience designing and installing cellular amplification systems. Please call us at 866‐912‐3444 or contact us online, and we’ll be happy to calculate the coverage area this system will provide in your building and answer any other questions about this amplifier.